Metallica (pronounced /məˈtælɨkə/ (listen)) is an American heavy metal band from Los Angeles, California, formed in 1981. The band was founded when James Hetfield responded to an advertisement that drummer Lars Ulrich had posted in a local newspaper. The current line-up features long-time lead guitarist Kirk Hammett (who joined the band in 1983) and bassist Robert Trujillo (a member since 2003) alongside Hetfield and Ulrich. Notable previous members of the band include former lead guitarist Dave Mustaine (who later went on to found the band Megadeth) and former bassists Cliff Burton and Jason Newsted. The band also had a long collaboration with producer Bob Rock, who produced all of the bands albums between 1990 and 2003 and served as a fill-in bassist between the departure of Jason Newsted and the hiring of Robert Trujillo. 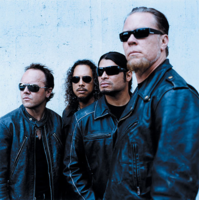 In 2000, Metallica was among several artists who filed a lawsuit against Napster for sharing the band's copyright-protected material for free without any band member's consent. A settlement was reached, and Napster became a pay-to-use service. Despite reaching number one on the Billboard 200, the release of St. Anger alienated many fans with the exclusion of guitar solos and the "steel-sounding" snare drum. A film titled Some Kind of Monster documented the recording process of St. Anger and the turmoil within the band during that time. Metallica has released nine studio albums, three live albums, two EPs, 24 music videos, and 45 singles. The band has won nine Grammy Awards, and has had five consecutive albums debut at number one on the Billboard 200, making Metallica the first band to do so; this record was later matched by the Dave Matthews Band. The band's 1991 album, Metallica, has sold over 15 million copies in the United States, and 22 million copies worldwide, which makes it the 25th-highest-selling album in the country. In December 2009, it became the highest-selling album of the SoundScan era, surpassing 1997's Come On Over by country artist Shania Twain. The band has sold an estimated 100 million records worldwide as of the release of their latest album, Death Magnetic. As of December 2009, Metallica is the fourth best-selling music artist since the SoundScan era began tracking sales on May 25, 1991, selling a total of 52,672,000 albums in the United States alone.